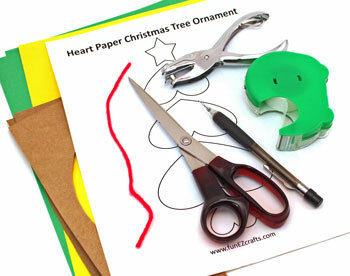 This easy Christmas crafts heart paper Christmas tree ornament needs only simple and inexpensive materials and tools. 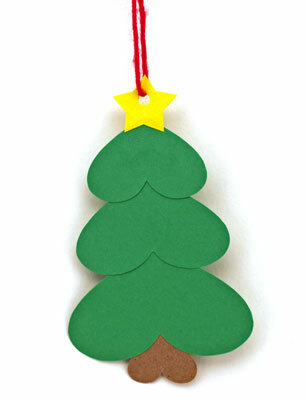 It's fun, easy and quick to make using construction paper, glue and yarn. Or, use other paper for a variation. 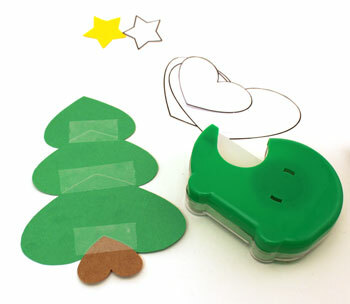 Let's look at this simple yet pretty little heart paper Christmas tree. 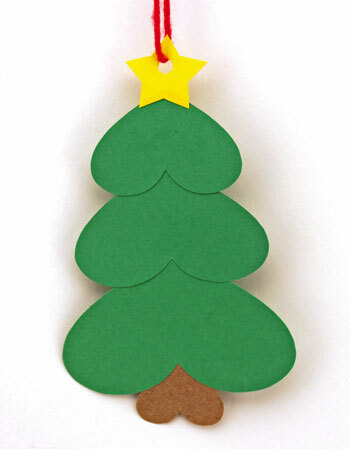 Anyone can have fun making this simple and easy little Christmas tree. It's simple shape can be easily decorated with sequins or small circles made with a hole punch. For this tree, take a look at the simple materials and tools shown here. 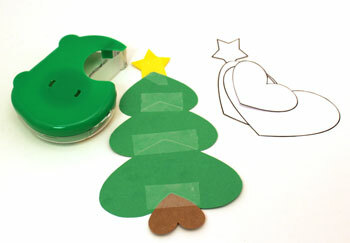 Print the Heart Paper Christmas Tree Ornament pattern. Cut one of each of the shapes. Cut the smallest heart from the brown paper. 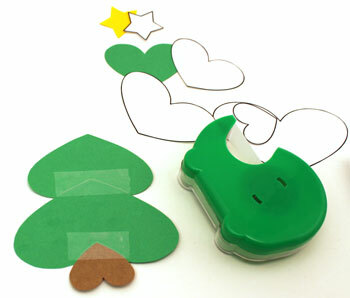 Cut one of each of the other three hearts from green construction paper. Cut the star from the yellow construction paper. 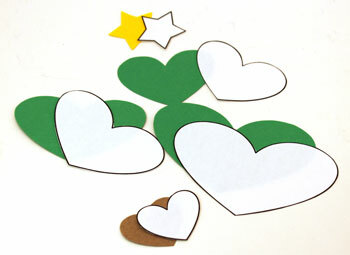 From the front, the large green heart flows over the small brown heart. From the back, the point of the small brown heart overlaps the inner point of the large heart. Add tape to hold the two hearts together. The medium green heart overlaps the large green heart from the front. 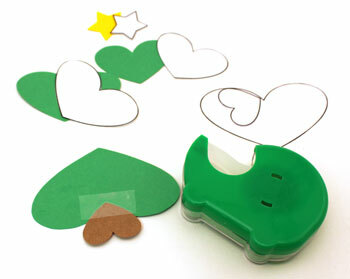 On the back, tape the point of the large green heart over the medium heart. 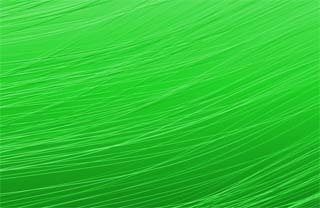 Follow the same process to add the small green heart over the medium green heart. Position the yellow star over the point of the top green heart. Add tape on the back to secure. Punch a hole in the yellow star. Tie a knot in the ends of the yarn to form the hanging loop. Hang the simple little heart paper Christmas tree ornament on a tree, a door knob, a cabinet pull or anywhere for remembrance of the holiday season. Simple materials and simple tools makes this a fun and easy project for people of all ages. And, for additional sparkle, glue sequins to decorate the tree, or punch small holes in gift wrap to form small decorations. 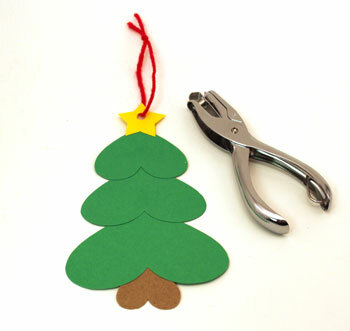 The inexpensive and Easy Christmas Crafts Heart Paper Christmas Tree Ornament provides inexpensive holiday fun for children, families, community centers or anyone at all.